Vroom! Vroom! 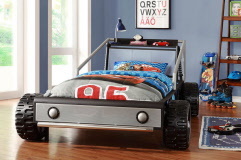 Your child will be one step closer to their dreams of being a race car driver in the Silver Racer Youth Collection. This low profile twin bed will get high profile compliments for the realistic fun design. Each bed features molded tires and display shelf. The bold color scheme of each bed will easily blend with décor from your child’s favorite race team or a creation of their own design. Dreaming has never been this much fun!